For seven years I had the pleasure and good fortune to work in the world’s largest laboratory for growing and characterizing exotic crystals, known as the “Epi-Center Laboratory” of the Materials Research Laboratory of the University of Illinois at Urbana-Champaign. You can see that I am dwarfed in this photo by all the high-tech equipment. What you see here is only about 20% of the whole laboratory: it’s one giant vacuum (UHV) system where stations for crystal growth and analysis are all integrated together. The entire laboratory is a so-called “clean room,” which means you need to wear special garments to ensure no dust or contaminants enter the laboratory area. By the way, each “MBE machine” (and here there were 10 of them) cost a cool $3 Mio, including all the bells-and-whistles. 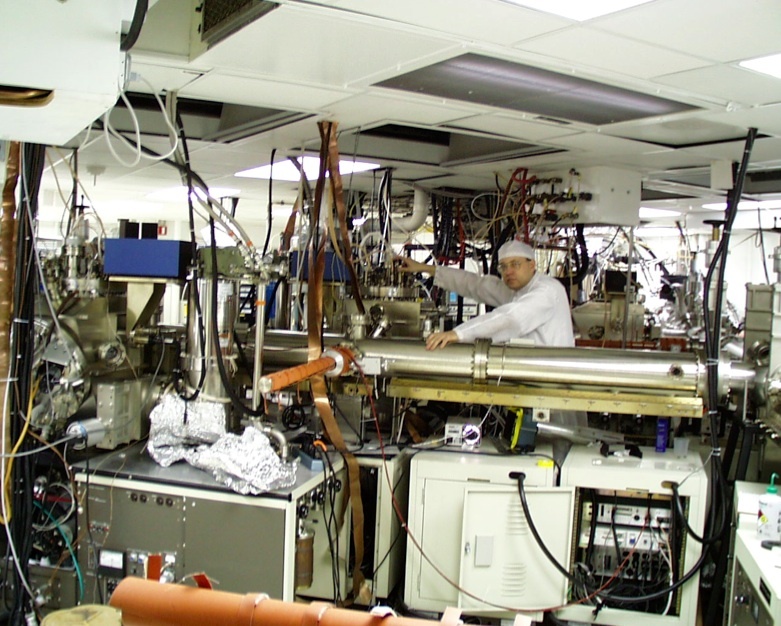 Laboratories like this don’t come with owner’s manuals; on average, it took each of the Ph.D. students like me over one year just to learn the basics of operating the equipment, and probably at least 3-4 years before we could call ourselves experts in the various exotic technologies that were used.